Last week wasn't almost a quiet week considering what had gone before. What had the Stockchart.com ers had to say about it? When interpreting price behavior you must become an armchair psychologist. Price patterns form as emotional investors have mood swings that take them from state of being dispirited and depressed, and believing that the seventh seal has been broken and that the Apocalypse is now here. Then to a state of euphoric tranquility about the massive gains that traders have been making right now, being almost in a state of denial. This time of turbulence has taken traders from a gut-wrenching feeling to nirvana all in the same week. But as I stated earlier that has allowed for some symmetrical triangles to form on the DJIA and the S&P 500. 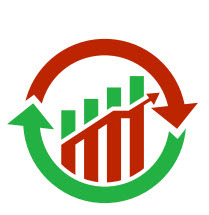 The recent rally retreat resulted in a failure to follow trough on the morning star reversal patterns on the daily charts of the S&P and the DJIA. But if a symmetrical triangle is being carved out as a result of the failure to follow-trough, then traders may be wise to buy once prices test the lower boundaries of the triangles again. I think that will occur early next on Monday or Tuesday, based on the short-term bearish signals on the 15- and 60-minute charts. 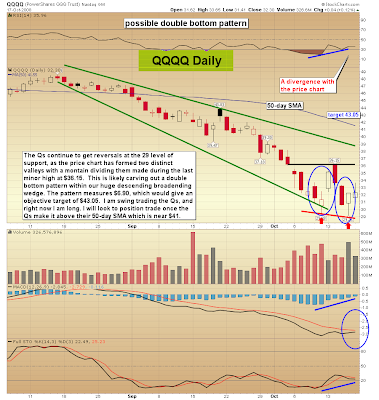 Two distinct valleys have now formed on the QQQQ's daily chart at the $29 dollar level, we witnessed one reversal off that area on Monday and the other on Friday. The double bottom is very clear on the 15-min chart of the Qs. 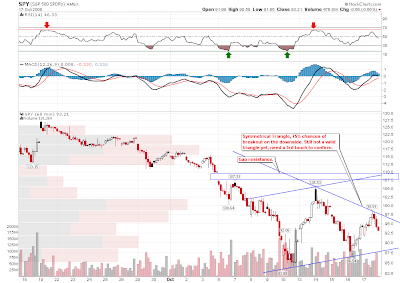 On the daily chart the Qs continue to form a huge descending broadening wedge. 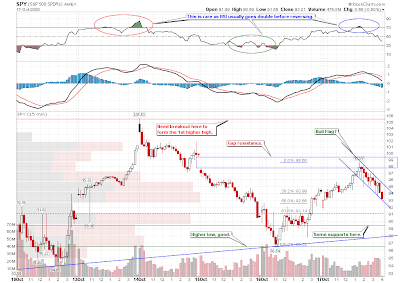 I believe that the double bottom will play out as prices move above its confirmation line at $36.15. Once that occurs prices may rise to challenge the upper boundary of the descending broadening wedge near $37.50. But if price meander around a bit we could see that falling trendline intersect with horizontal resistance at $36.15. 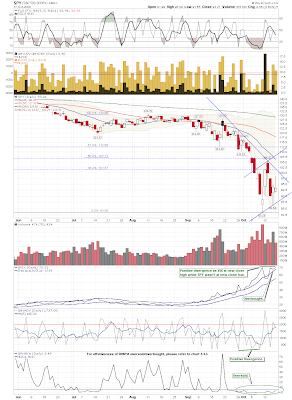 It is interesting that a divergence has formed on the RSI in the daily timeframe and the MACD looks poised for a bullish cross. Market breadth is trying to improve with the A-D line and should the McClellan Oscillator move above zero it may support a confirmation of our morning star reversals on the daily charts. 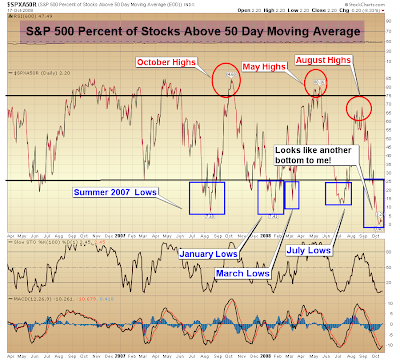 Moreover, S&P 500 stocks above their 50-day moving average looks to be confirming a short-term bottom at these levels. We have a higher low on the DJIA and S&P, now lasts watch for a higher high next week and see if the triangles play out. 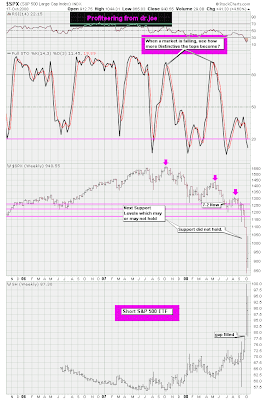 Looking at Joe Reed's S&P chart the 1,250 level is looking like the rally point for the S&P before the next rollover. 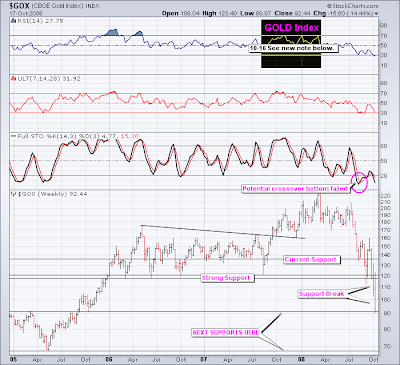 The gold index is another one up for grabs. One failed signal but closed the week at another support level. 10/18 -- The green upchannel is still intact on the short term charts, HOWEVER, Friday's afternoon reversal raises a big yellow caution flag. Firstly, it broke the blue mini, which had barely gone halfway up the green channel. This made me look for another possible scenario and that's where the orange line popped up. That line would portend a much more bearish scenario with considerable short term downside and warrants consideration, even though I do not yet see a parallel channel line below it. We should know on Monday whether this was just an expiration-related decline or something more serious. 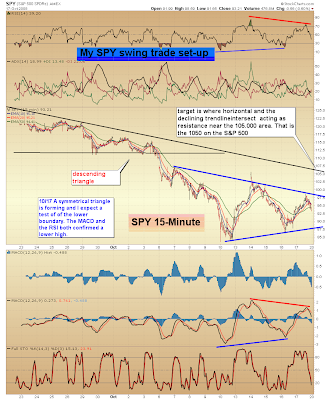 I would be cautious with long positions unless we can cross that orange line to the upside. 10/16 -- Besides giving us a scare, today's low and subsequent reversal did give us the higher low we needed to complete the lower line of the new short term upchannels. The scare came from the fact that a couple of indexes (like the QQQQ) threatened breaks briefly before recovering...but that's history now. 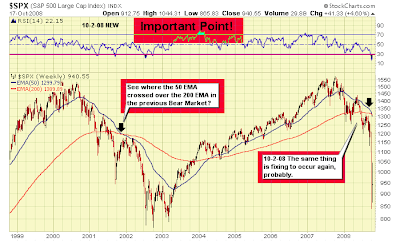 The SPX and RUT charts were perfect touches while the other indexes missed by a little either way. So we now have a bonafide upchannel -- the first in quite some time. Because the first leg of the channel was the 900 point up day, the channel is a wide one. The Dow, for example, wouldn't hit the upper line again until 10,000. The first two legs of this channel formed good minis. Hopefully, we'll get another mini here on the upside to help guide us. Volatility continues to break all manner of records. This morning, with the market down, calls I wrote on the QQQQ were actually higher. McMillan says the November VIX futures have a 24 point discount. That would suggest a nice upswing in November, but still actually leave us with abnormally high volatility. I guess we're just going to have to get used to several hundred point swings in the time it takes to get coffee.